Welcome to June! There is something about this month which is yet to be discovered, and we have been waiting for June to arrive here for such a long time! So, what is your plan? It would appear there is something which you hope to accomplish, perhaps a few things, and, finally you are feeling ready to put a viable plan, or two, into motion. While this is the Tarot Card of the Day, this is not a one-day deal. This is about setting about to do things which will affect you for the long haul. The 3 of Pentacles involves having a meticulous, detailed plan, a blueprint, if you will. It is important to note that any good planning should allow for alternate options and tweaking along the way. A little bit of this is repair mode. You can not go backwards and make things as they were in the past, but you can remodel your life in such a fashion that you breathe new life into it, similar to slapping on a fresh coat of paint to make things all shiny and new. Part of this card is teamwork and shows that not everything which you need to do can be done alone. Your projects may require the help of several individuals, each with their own unique set of skills which they bring to the table. It is not about everyone being at the same level. Everyone can learn and benefit from working together on this one. Contemplation, soul-searching, re-evaluation, reflection, refocus, meditation, disillusionment. When there is a loss of focus, Crane enters a meditative state of reflection, dawning a new light. Innovative at using new approaches to solve problems, Crane is here to help you renew your optimism, bringing clarity and insight. Crane will guide you in taking the time you need to renew your energy, and embrace something that you feel passionate about. Passion will help you move beyond a state of disinterest, and you’ll soon find yourself motivated into action. It’s up to you to choose to see the opportunities that are right in front of you, and to act upon them. Rest and meditation will deliver a fresh perspective. Take this time to reflect and regroup, and re-direct your energy. 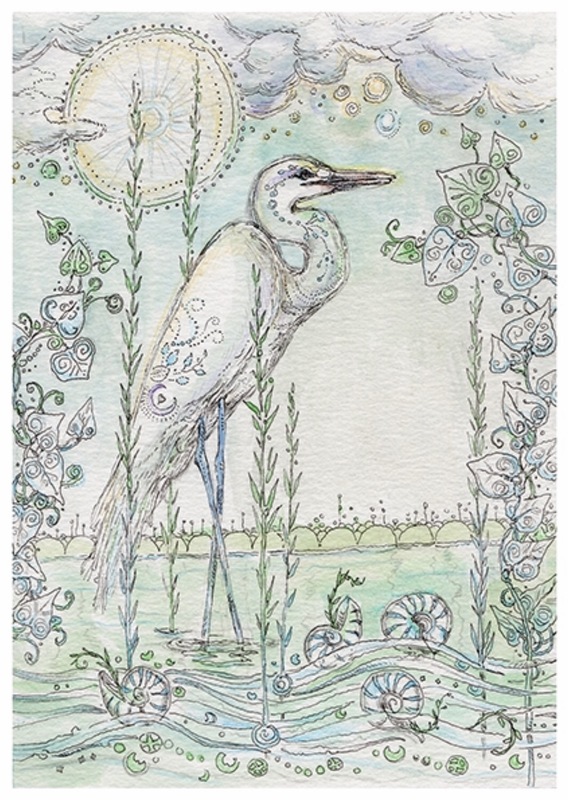 This entry was posted in Artist, Deck Review, Featured Card of the Day, General Tarot, Readings and tagged 4 of Shells, Crane, Paulina Cassidy, Spiritsong, Tarot. 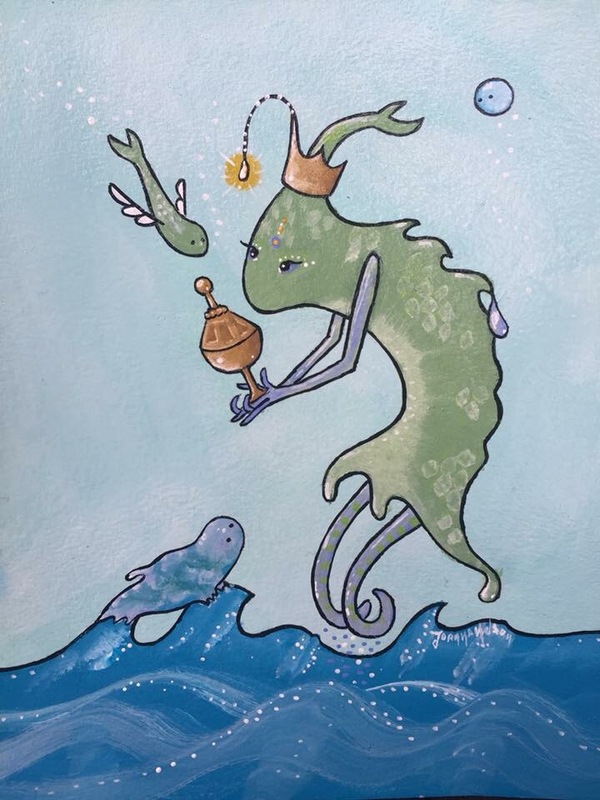 This Queen of Cups could be you today, whether you are rescuing a less-fortunate creature in need of human help, or stepping up to offer a kind gesture to someone who needs it. Remember, this Queen can be you, or someone around you, that person upon whom you can count in times of crisis, the “helpers”, if you will, who always rush in to help while maintaining a composed demeanor. Should you be in line for a new job position and need to go an interview today, do your best to embody the energy of this Queen; she is cool-as-a-cucumber, calm and collected, and not one to be anxiety-ridden. Remember, for success, never let them see you sweat. This entry was posted in Card of the Day, General Tarot, Patreon, Readings, YouTube Videos and tagged Card of the Day, Guidance, Path, Queen of Cups, Reading, Tarot. Contemplation, observation, wisdom, inner-balance, solitude, learning, meditation. 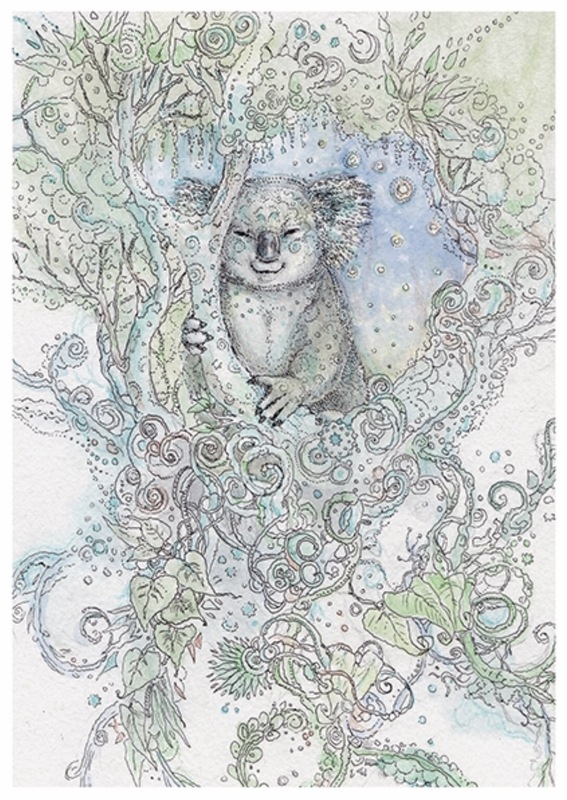 A shepherd of well-being, Koala is your guide in acquiring the rest needed to regroup and renew. A seeker of truth and wisdom, he illuminates the way. Calm and observant, Koala stills the mind so that he may access higher wisdom. His solitary retreat gifts him with the time and space necessary for introspection. Koala would like for you to slow down and step away from the distractions of the world. Take time for yourself to gather your thoughts, and find your inner balance: the answers you seek are already within. 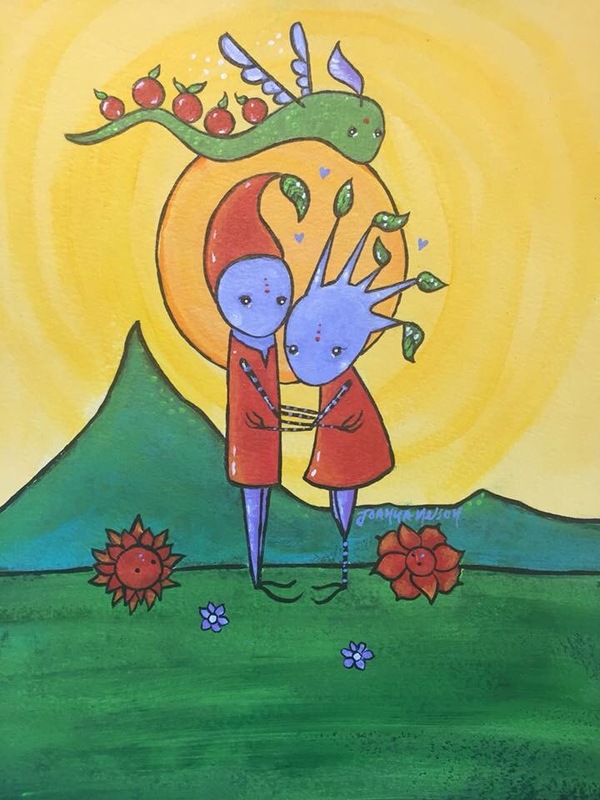 This entry was posted in Artist, Deck Review, Featured Card of the Day, General Tarot, Readings and tagged Hermit, Koala, Paulina Cassidy, Spiritsong, Tarot. Today we have another card from a deck-in-progress, tentatively titled ‘Whispering Spirits’, by Joanna Nelson Studio. You can follow Joanna and watch her create this deck which will be available later this year. Our Lovers card is making a very timely appearance today, and, yes, I am actually going to bring up the word “love” itself. For today, and actually in play from the 28th through the 31st, we have a rare occurrence in the Universe which is known as a Grand Water Trine. This is a positive and beautiful thing. Jupiter is in Scorpio (water), Venus is in Cancer (water), and Neptune is in Pisces (water). When we see this type of trine, emotion is part of the equation, yes, but also intuition is running at peak levels. It is important to pay attention to one’s intuition, especially when it comes to relationships. With Venus (relationships/love), being a part of this trine, there will indeed be some facet of relationships which has your attention. Allow your intuition to guide you with any important relationship decisions which you need to make. The age-old adage, “If you keep on doing what you are doing, you will keep on getting what you are getting”, applies here. In other words, this is a perfect time to review your choices, especially if you have been feeling as though the outcome is always the same. It is easy to fall into a rut with patterns of choices, and now may be the perfect time to break out of those worn-out ways and choose differently. Remember, this is a very positive transit, and you can really use it to your advantage, if you choose wisely. Balance, harmony, moderation, patience, connection, cooperation, healing. Zebra pilots the harmony of opposites. Self-disciplined, she will show you how to find balance, and how to face problems with an air of calm. As with her stripes, the yin-yang balancing of opposites brings forth the ability to maintain harmony. She wants you to recognize challenge as a chance for growth, and to know that opposing forces will enable you to see a deeper truth. A bringer of clarity, she will show you how you can better pace yourself in order to make the best decisions. Consider your next step with patience and understanding, as any new situation takes time to adapt. By being receptive and in harmony, you are allowing higher powers to help guide you. Healing takes place as you correct the imbalances within. 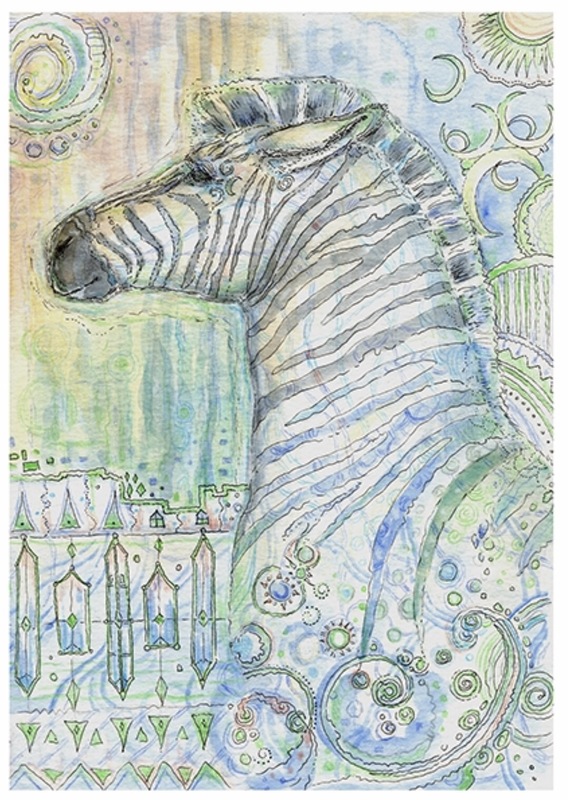 This entry was posted in Artist, Deck Review, Featured Card of the Day, General Tarot, Readings and tagged Paulina Cassidy, Spiritsong, Tarot, Temperance, Zebra. Full Moon blessings to all! Today is the annual Full Moon in Sagittarius, and it is a very special Full Moon, one where you can begin the work on one of those important wishes which you hold so dear. The Moon card, which is so awesome to see today, is just like the Full Moon itself, asking you to let go of your fears in order to move forward on your path. The light of the Moon is dim, thereby making it difficult to see exactly where you are going. But, by releasing those fears, you open yourself up to the guidance of the Universe, and know that, when the timing is right, you will emerge in a place which is exactly where you are intended to be. Today’s Moon card is from a deck-in-progress by Joanna Nelson Studio, tentatively titled ‘Whispering Spirits’. 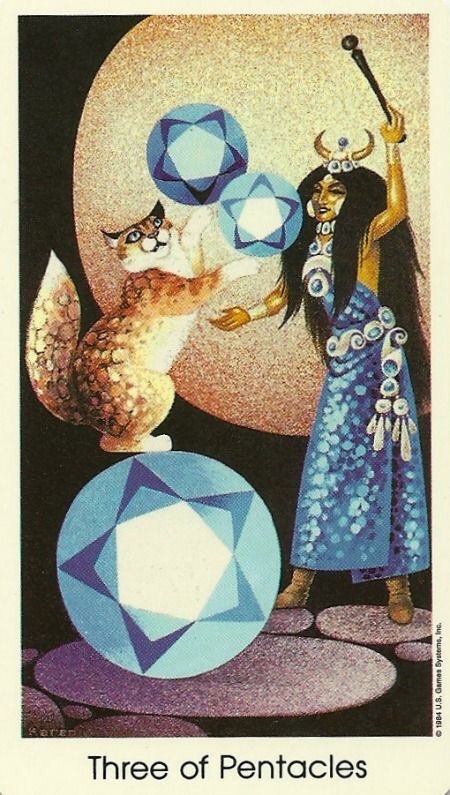 If you love Joanna’s work (she’s the creator of Monstarot and the Catland Oracle), then do be sure to follow her for updates on this deck which will be available later this year. You have been waiting six months, since the New Moon in Sagittarius in December, for this Full Moon to occur. It culminates a cycle which was needed to complete before proceeding on the next leg of your journey. This entry was posted in Card of the Day, General Tarot, Patreon, Readings, YouTube Videos and tagged Card of the Day, Guidance, Moon, Path, Reading, Tarot.